I immediately recognized a few elements from “Iconoclash” used in a totally different way but the demo took me by surprise a bit. I couldn’t exactly put my finger on what I was watching. 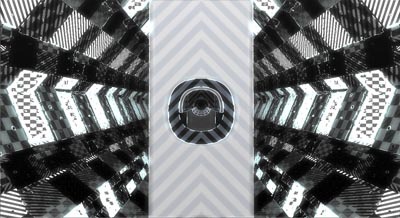 Not sure whether the visuals were random garbage or a stroke of pure genius I decided to let them sink in before I started making the music. And so for the next month I kept on watching the demo at random intervals trying to decide on what kind of music I’d fit to the demo. Days later, and after realizing that the most fitting music for such a demo would be on genres I’m not really familiar with and not at all sure if I could compose on them, it hit me. It was more than apparent that the visuals being all out of the norm and noisy and erratic would create a huge rift on the scale of likes and dislikes, so why not the music as well.. but in reverse.. So, I started thinking and laying out ideas about a track that would on one hand have a beat to trigger Navis’ beat sync algorithms but on the other hand it would have to be disconnected enough from the visuals in order to trigger a self-controversy sentiment in the viewer. As such, I went for a trancey – mainstream-ish cliche, trying to steer away from complex ideas, time signature or tonal changes, syncopations and all that jazz. This tune had to appeal to most of those that the visuals don’t. I started sending versions of the tune to various friends and acquaintances trying to get feedback from. The results were promising. I heard many words being used by people when describing that first beta of WUMW (which initially was written in A minor) such as “oldschool”, “eurovision”, “club”, “90′s” and various opinions ranging from “you can do better” to “one of the best you’ve written so far”. Perfect! Right about that time I started contemplating about putting in lyrics. Guided by the demo title I started writing the lyrics which somehow had to include the demo title in them. Another flash of Bette Midler struck my mind, and the eagle in the beginning and the end of the demo was not helping sever the connection (…I could fly higher than an eagle, ’cause you are the wind beneath my wings…). So, since it was Navis’ fault to begin with I got him to help me with the lyrics. I sung them into a vocal guide version (which ended up the version submitted to Euskal’s HQ music compo) and started looking for a singer. Fortunately, the notation software has progressed a lot and I found out that writing the score now is much much easier. I hooked Sonya on Sibelius and started playing the melody, only to realize that either the USB Midi lag kills my performance OR my timing fluctuates seriously on the erratic side. The first attempt sounded pretty much ok.. but the visual result on the sheet was… uhm… similar to a bowl of angry flies! So I went for the next logical step. Being mostly unfamiliar with Sibelius’ editing tools, I wrote the melody in Reason, exported it into a midi file, imported it in Sibelius and WHOA!!.. Magic! I added the lyrics beneath the notes (which was an incredible experience as to how easy it was) trying to keep in mind that our version uses the word “UNDER” and not “BENEATH” I sent the sheet to Valeria and let her study it. The next day she asked me if we could transpose the tune to F minor as the highs were going out of her vocal range. I really had no idea what her vocal range was (or how she’d sound on the tune) so I transposed the tune to F and going in with a bit of blind faith regarding the end result. The song sounded weird to my ears when brought down to F. Some instruments were too low now, and if I bumped them an octave up they sounded too high. So I changed a few sounds here and there which ended up altering the tune quite a bit. After trying quite a few mixes and after burning 9 different CD’s with the tune (I do that to listen the tunes I make in my car, which I use as my reference system for the final mix.. and no.. I don’t have mixing equipment in my car if it crossed your mind =P ), the instrument mix was ready. The only thing remaining was recording and mixing in the vocals. We arranged with Valeria to perform the recording session the day Euskal started. Navis already had the vocal-less version so if things went south he’d submit the demo using that version. And so Valeria came by and we recorded about an hour’s worth of material out of which I’d later pick, mix and match to make the final vocal line. At that point, my inexperience in working with vocalists became apparent to me. The melody I wrote had so big a range that put quite the stress on Valeria, especially at the lower frequencies but it was really too late at that point to make changes to the melody line. Nevertheless, now that I know what Valeria’s vocal range is and how she sounds, if we work together again in the future I’ll have a better understanding and knowledge of how to write for her voice. I assembled, fine-tuned and mixed Valeria’s track in the song, burnt yet another CD (which fortunately proved to be the last I needed to burn, and unfortunately was the last available empty CD I had) and went for a ride to check it out on my car’s stereo. The song was ready. I sent it to Navis and let the ball roll. Unfortunately the demo’s distinct parts and hard cuts did not precisely coincide with the beats or section changes of the song, and there was no time to make changes to the demo code, so we decided that we’d go for a “first” (or well yet another first) for that demo and release a final version after the party! This demo is not for everyone. It will either come first or last in the compo. I personally rank it very highly amongst our demos so far. I love this demo. And the final act of this demo is being played on pouet. When I started writing the music having a quasi-serious “social experiment” intention, I never thought that it would go that far. Apparently this demo has polarized our viewers so much, that it might rank as our most controversial demo of all times (and we’ve been doing controversial stuff for quite a while now). Opinions range from utmost adoration to utmost hate. People who love the visuals but think the music is garbage. People who puke at the visuals but really dig the music. People who love both separately but can’t see them together. People who are begging me to go back to guitar tunes even though they’ve been begging me in the past to steer away from them. Personally I was quite detached from the demo until I started encoding video versions of it for youtube and vimeo. At that point I had to watch it again and again to check for quality and artifacts and after multiple views the demo started talking to me. There’s something in there that I can’t quite grasp.. but there’s more, and I can now understand those who say that it gets better after multiple viewings.